Toku Toy Store visited Toy Fair and London Olympia this week to give you the rundown on all of the newest tokusatsu toys and collectables available to retailers in 2018. As you’d expect, the only real toku on offer was Power Rangers but we were able to take a look at the next wave of Legacy items as well items not previously announced for the Power Rangers Super Ninja Steel toyline. Unlike previous years, Funko granted access to all retailers without the need for an appointment. Their space was lined with a display of of Funko Pops past and present with Power Rangers well represented. Deeper into the space, the next wave of Hero World figures were hidden away on the bottom shelf. Funko were unable to confirm a UK release date or whether the line would be exclusive to any particular retailer but said that they are coming. Also on display were Power Rangers Ninja Steel Mash’ems. Mash’ems describe their product as “a highly collectable toy that all kids will love. Mash’em allows kids to play with their favorite characters in a whole different way. They will be able to Mash’em, Twist’em, squish’em, and Stretch’em.” Mash’ems have been made for previous Neo-Saban era seasons but these haven’t made it over to the UK. The distributor would not state whether any of the major retailers had picked up this toyline. Up the stairs at Bandai UK’s stall, there were lots of Legacy treats to be found. Many of the next wave of Legacy figures that have recently seen a US release were on display. Legacy Zeo and Dino Thunder are expected February with an RRP of £24.99. Early prototypes of the Legacy Psycho Rangers were available to view but, unfortunately, work continues on this product as they are unable to stand up at present (Bandai had them laying down on the shelf!) Auto-morphin figures were also available to look at and are expected February with an RRP of £24.99 each. The large size non-combining Legacy Zords were on display. The Tyrannosaurus Dinozord truly is a feast to behold. This line has got a lot of flack for it’s lack of ability to form the Megazord but in my opinion it is well worth the £29.99 RRP price. In addition to Tyrannosaurus, Saber Tooth-Tiger and Mastadon were available to view. This is the first time Mastodon has seen the light of day worldwide. The Legacy Zeonizer and Golden Power Staff were on display. While we’ve seen these before, we now have a price for UK release: £99.99 for the Zeonizer and £149.99 for the Golden Power Staff. Both items are expected to release in March. On the shelf above these items was the full cosplay-sized Green Ranger helmet as well as the smaller display-sized White Ranger helmet. Display helmets are expected to start hitting stores this month while the Green Ranger helmet is expected in March, alongside the Zeo items. Bandai were very strict about photography and would not allow us to take any pictures. There were some sneaky photos taken by other attendees though, so we’ve included them here for your viewing (Credit to @SimplePeteDoodles). Last year, Toy Fair saw the debut of the Lion Fortress Zord and while there was nothing quite of that magnitude on display, we were treated to some non-before seen items in the Super Ninja Steel toyline. This year, Toy Fair saw the worldwide debut of many fantastic items. The two main surprises were the Super Steel Blaster, a bright red cannon style weapon based on the Lion Fire Zord. The blaster features sounds and is capable of shooting darts up to a distance of 60 feet. The RRP for this item is £44.99 and, like the majority of the Super Ninja Steel toys, will release in July. Next up, was the Simian Sniper Guard, a motion activated dart launcher modeled on a gorilla. There was a mock-up box standing next to the toy, confirming its functionality but the distance you can shoot darts was labelled TBC. The RRP of this item is a rather pricey £49.99; we’ll need to see more of this toy in action to know whether it’s able to justify the price tag. The Superstar Blade, Ninja Steel’s answer to Ninninger’s Gekiatsutou Ichibantou was on display. Like it’s Japanese predecessor, the toy looked identical to the standard Ninja Star Blade repainted in the blue and burgundy colour scheme. The toy will RRP at £29.99 on release. Already seen on shelves in the USA, the Lion Fire Morpher and Blaze Megazord were available to view. The Lion Fire Morpher features a twin dart launcher; Bandai are really digging launchable darts in this toyline, it appears. The Lion Fire Morpher will retail at £34.99 and the Blaze Megazord at £42.99, both scheduled for July release. Finally, alongside the standard Ninja Stars we’re used to from Ninja Steel were two new and different types of shuriken. There were some solid plastic stars laying down on the shelf (too solid to make it to retail, I believe) and other rubber based stars with suction cups around the outside. These Special Ops Ninja Stars, like everything else, are available in July and will retail at £7.99 a pack. 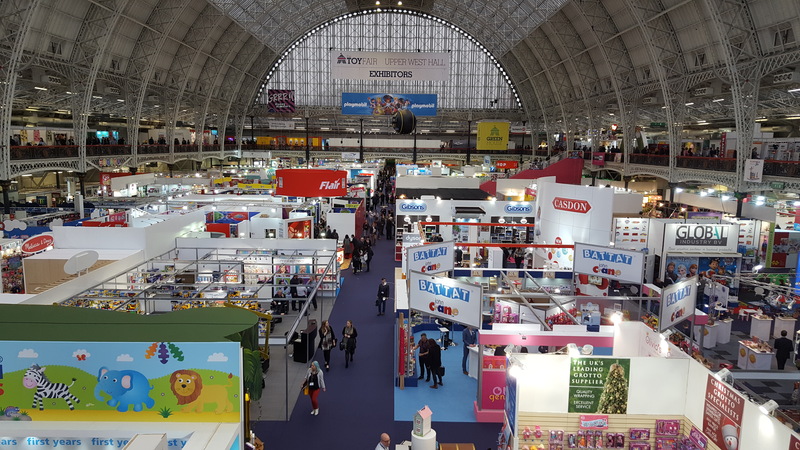 That’s it for Toy Fair in 2018; what toys are you most looking forward to? Comment below and let us know your thoughts or join the conversation on our Facebook and Twitter pages!